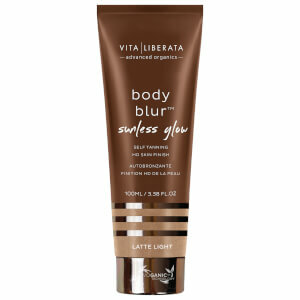 Vita Liberata's Body Blur Instant Skin Finisher is a wash-off body make-up to leave skin with an immediate photo-ready, air-brushed effect. Fortified with light-reflecting particles incorporated in BodyBlur™ Technology, the skin-perfecting formula minimises the appearance of blemishes, imperfections and uneven skin tone. Suitable for use on the face and body, the lotion contains a nourishing blend of natural and organic extracts, including Shea Butter, Glycerin and Aloe Vera to moisturise and condition skin, whilst delivering a tint of natural-looking colour for a sun-kissed finish. Can be worn under foundation for a smooth, velvety soft finish. A dose of Tocopheryl Acetate provides free radical protection to fight signs of ageing. Alcohol, paraben and perfume free. For body use a tan mitt or your hands. Apply in small pea sized dots along limbs and then blend well in long circular movements. For face and décolleté apply sparingly with fingers or a foundation brush. Wash hands after application. Aloe Barbadensis (Aloe Vera) Leaf Water*, Aqua (Water, Eau), Glycerin*, Cyclopentasiloxane, Cetearyl Alcohol, Dimethicone, Cetyl Alcohol, Glyceryl Stearate, Phenyl Trimethicone, Isohexadecane, Panthenol, Disodium EDTA, Butyrospermum Parkii (Shea) Butter, (Beurre)*, Saccharide Isomerate*, Tocopheryl Acetate, Phenoxyethanol, Cucumis Melo (Melon) Fruit Extract*, Hyaluronic Acid, Ethylhexylglycerine, Vitis Vinifera (Grape) Seed Extract*, Ginkgo Biloba Leaf Extract*, Synthetic Fluorophlogopite, Homosalate, Hydrolysed Silk, Tin Oxide, CI 77891 (Titanium Dioxide), CI 77491 (Iron Oxide), CI 77492 (Iron Oxide), CI 77499 (Iron Oxide). Body blur is great, it gives a gorgeous instant bronzed look but with a yellow toned true olive colour (no orange or pink tones here!). Unlike other instant body bronzers, Body Blur gives a soft matte finish with micro shimmer which just makes skin look perfected, rather than disco ball crazy glittery. This is an instant tan for grown-ups, perfect if you hate dealing with fake tan smell, staining and patchiness when it starts to fade. Body Blur is great even if you have a base tan. It's a cool-toned brown so it looks really natural. It makes my skin look healthy and glowy with little fragments of shimmer.I haven't had any problems with it transferring on my clothes. This is one of my all time favourite beauty products. It's so easy to apply and blends in so is streak free. My legs especially look a natural colour and there is a slight glitter which sparkles in the sunlight. 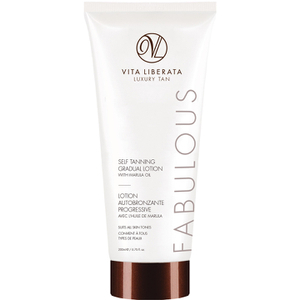 This is fabulous for any special event as you can tan on the day without waiting for it to develop. I use it on my face too but usually just rub the excess off my mitt once I have done the rest of me! Highly recommended. I love a good fake tan and let's face it in the uk it's the only type I'm likely to get, but with any brand I use I find it doesn't take on my legs evenly and after years in retail and standing all day, little veins have appeared. This product blends in beautifully no streaks a very natural colour, there is some sparkle giving a nice glow, not glitter legs which also seems to help blur those pesky veins? It says you can mix it with foundation or alone on your face too, so will be giving that a go too as I personally don't like using self tan on my face! All in all I ❤️ This! !